I was in raw agony, the worst pain I've ever experienced as a human, for three days. Then yesterday I visited Dr. Lisa Germain, who said the sweet words, "You need a root canal." Sweet words? Well, consider that this meant she was going to inject vast quantities of numbing elixir into my mouth. Consider that until I walked into her office, I considered head amputation to be a viable treatment for what I was experiencing. Consider that I was remembering with relish the scene in "Castaway" in which Tom Hanks becomes his own dentist using an ice skate. An hour later, I was the lion who has had the thorn removed from his paw. I am becoming emotional as I type this, such is the relief I am experiencing. Dr. Germain labeled me a "true dental emergency," saying that she gets about one of those per month. I was Mr. January. Thank you, Dr. Germain. NOTE: My trivial root canal is nothing compared to the battle being waged at NO Pickles. Go cheer that man on. He's a tough mofo, but allies in his war can only help. Is this guy gonna do Hurricane Andrew references on posters in Miami? As Dr. Morris says, go see Varg. The last time the United States held a national election without a Bush or a Clinton on the ticket of the two largest parties, I was 11 years old. The surest sign that we are reliving the late Roman Empire is that we are taking our "leadership" from the same couple of incestuous familial groups. We probably are a doomed later Rome, but let's pretend like we're not. Let's work as if we can be an innovative, prosperous, just, ecologically sound society. So let's keep Bushes and Clintons off of the tickets of the two biggest parties now and forever. Okay, maybe not forever. Let's put a 100-year moratorium. Hillary? Ha. And you know that pinheaded governor in Florida is just champing at the bit to run. James Webb, John Edwards--these are at least plausible choices. And there's got to be more talent out there. Please step forward. We on the Gulf Coast should take the lead, because we know better than anyone that there is no "there" there. We know what happens in the absence of leadership. We need to let people know just how bad things are. Maybe you noticed this glaring omission, but it warranted coverage in Ireland that W made no mention of the Gulf Coast, New Orleans, Katrina, etc. He did mention the word Iraq 34 times. Once again, the Man who lectured Al Gore on the folly of Nation Building and pledged 'humility' in foreign policy gave a 'State of the Empire' address, not the State of the Union.
. . . if it's a stand-alone parade well before Carnival, that is. We should thank the Saints by pouring ourselves into our work and our homes, showing that we can follow their example. If it's some kind of add-on parade before a regular Mardi Gras parade, fine, but I probably still won't go. Besides, I don't think Coach wants a parade for a 4th place finish. Let's wait till we come in 1st. Fourth place only wins something in a superfecta at the Fair Grounds. UPDATE: Dr. Morris thinks it's a silly waste of time too and has the link for the story. Payton is king of Orpheus; that suits our style much better. UPDATE 2: The parade won't happen. Bloggers and New Orleans win! Lesson for OT: Don't blab to the media before you get things straight. Wanna Feel Better about the Saints? It's going to take a lot more than this to make any of us feel better about the city and our future, but here's a formula for feeling a little better about Our Team. 1. Read what Ray and Mark had to say about where we stand now. I dare somebody to try to top those two essays. Can't be done.
. . . because the Saints' "bread and circuses" tour is over. We're paying much closer attention now. Much closer. I Say No Matter How I Try I Realize There's No Reply . . .
Deuce had nine touches today. Nine. We had a chance to come up big, and we did not. That is the difference between us and President George W. Bush and the Army Corps of Engineers. We screwed up, and we feel horrible about it. We admit it. President George W. Bush and the Army Corps of Engineers think everything is fine. But you know what? The Krewe du Vieux parades the Saturday night before the Super Bowl. In New Orleans. Not in Chicago. Not in Miami. In New Orleans. Damn I wish we had won today. Win or lose . . .
We are prepared. We are World Class New Orleanians. World Class New Orleanians don't want to hear a word about destiny and the Saints today. Why not? 1. If you want to talk about the Saints being destined, you have to include in the story the city and region being slammed by Katrina, the levee failures, the relief failures, Rita, and the recovery failures. You know: "Oh, those poor people. They were so hurt by the storms, and then this team comes along and helps revive their spirit. It's destiny." No. No. First, the multiple disasters that we are enduring were not destiny. A hurricane (perhaps fueled in part by manmade environmental impacts) hit our region. Mississippi was devastated by the storm surge; New Orleans was devastated by governmental fraud and incompetence. That's not destiny. 2. Tell the Saints it's destiny. They'll laugh at you if they're being honest. Was their grueling camp at Millsaps College destiny? No, hard work. Were Sean Payton's brilliant game plans destiny? No, competence. Were our outstanding players at the skill positions on offense destiny? No, competence. 3. Old New Orleans believed in destiny, and that's part of what got us where we were. New New Orleans believes in grittiness, choice, hard work, creativity, and competence. But we still know how to keep our traditions, our community, our sense of raw fun. Don't talk to us about destiny. This isn't destiny. This is years of fan dedication. This is signing great players with character. This is a hardworking, competent coach. This is game day. I have my game face on. Don't talk to me about destiny. "Synchronicity" is the word Mrs. Gleason used last Saturday night in the Superdome. Let me explain. Last summer--I think it was June--I went to Kinko's on Tchoupitoulas to make some copies. I tried to put my Visa in the copy machine, but it wouldn't go: someone had forgotten his card in the slot. (I've done that myself at least twice, each time luckily retrieving my card from Kinko's a few hours after my carelessness.) I ejected the card, took it, and saw that the raised letters on it read "Stephen Gleason." "Hey, that's cool," I thought, "the Saints have a guy named Steve Gleason." It's a common enough name, though, so I wasn't thinking much as I brought the card to the desk. I turned it in to the clerk. I made my few copies, ejected my own card (for once), then headed for the door, and that's when I recognized Steve Gleason of the New Orleans Saints standing at a table organizing some papers. "Mr. Gleason, hi. I just found your card in that machine over there and turned it in at the desk." "Oh, wow. Thanks." We walked to the desk together, and he retrieved his card from the clerk. I asked him,"How's it going this summer at Airline Drive? Are we going to see you in the Dome again this year?" "It's good, but you never know. We have new coaches, so I'm just working hard, and we'll see how it goes." "Well, my brother and I have season tickets, and we're cheering you on. Take it easy." Steve Gleason and Curtis Deloach made the pivotal play of this season. That blocked punt and touchdown set Our New Orleans Saints on the path that has led to the NFC Championship Game. For Christmas, Dr. Mrs. Clio gave me a huge poster of that picture. It's now framed and on my office wall. It is quite admired by everyone in my building. So I see an airborn Steve Gleason every day at work. Now fast forward to January 13, 2007. Dr. Morris and I were in the corridor outside Section 635 in the Dome, heading up to see Chef Who Dat. 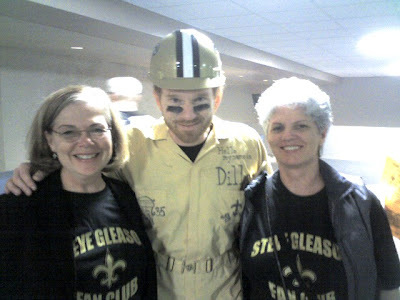 We saw two women wearing "Steve Gleason Fan Club" t-shirts. Being sociable guys, Ashley and I approached them. "In my office, I have a poster of Steve Gleason blocking the punt in the Atlanta game," I said. "That's great!" said one of the women. I then relayed my Steve Gleason credit card story. One of the women said, "That's a great story, and she will be happy to hear that, because that's Steve Gleason's mom, and I'm his aunt." I swooned. I was speaking with the mother of the author of The Block. This woman gave birth to him. "Thank you for giving us your son," I said. "Well, you're welcome," she said with a big smile. Anyway, Steve Gleason's mom and aunt had 300-level tickets and had accidentally gone too high in the Dome, ending up talking to us Terrace dwellers in the corridor near the escalators. Mrs. Gleason told Ashley it was synchronicity. We were supposed to meet so that I could tell her that story. It turns out that Mrs. Gleason (who is working on her Ph.D.) helped Steve collect 7,000 school bags and supplies and shipped them to New Orleans after Katrina and the levee failures. As the Times-Picayune showed a few days ago, Steve Gleason (and his mom) "get" New Orleans. So here it is (photography by Dr. Morris): me, in my Dilly mode with eyeblack applied by Dr. Morris, with Steve Gleason's mom and aunt. 1. The New Orleans writers all pick the Saints. That worries me a little. 2. A couple of Chicago writers pick against the Bears. That impresses me. The biggest thing I notice, however, is that in their comments, every New Orleans writer focuses on the positive: the good things about the Saints that will contribute to a victory. Many of the Chicago writers who predict a Bears victory feel the need to rip the Saints and talk trash. That bugs me. They're probably on Dennis Hastert's side. I am proud that the New Orleans writers, while being blatant homers (a bit of a worry), focus on the positive rather than rip the Bears. That's the World Class spirit that we try to start with in this blog (although we're not afraid to get dark when the subject calls for it). Stay calm, work hard, pay attention to detail, focus on your own game and not the other guy's game. I'm learning from Coach Payton. Rooting for the Saints and ripping the feds--excellent. Let's all remember Mister Hastert on Sunday. If he's not in the stadium Sunday, Mister Hastert will probably be watching the game in a Ruth's Chris steakhouse and talking about how the Bears are moving forward. UPDATE: (Thanks, Oystah) Not only do Chicagoans live in a land with lethal wind and cold; the heat kills people by the hundreds there as well. 2. 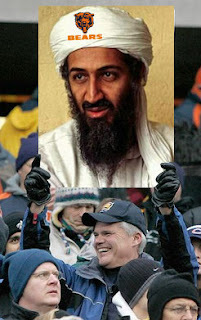 Chicago gave us the Mike Ditka era in New Orleans. Remember that. Need I say more? 3. The T-P reports that a big sign in the Bears' locker room reads "Play Angry." Ha. Ask Deuce about playing angry. Ask him as he runs over your face. Ask him as you're getting into the Bentley that has made your life so hard. Know what helps one play angry? Watching a natural disaster get superseded by a manmade disaster in the city where you earn your living. Deuce. Up. Side-yo-haid, I say Deuce-upside-yo haid. Thus endeth the angry incoherence. "The new Democratic leaders in Congress also need to recognize that the many failures of Hurricane Katrina are more than just another reason to criticize the president. They need to quickly outline their own plans for salvaging New Orleans, so evacuees can once again call their city home. That new Orleans remains a shattered city is a sad monument to impotence for the most powerful country in the world. Our grand plans were never laid, our brightest minds were never assembled, our nations' muscle and ingenuity were never brought to bear in an concerted way to overcome the crisis of the Gulf"
First, Stephen Colbert used the Saints' proximity to the Super Bowl to do some brilliant stuff tonight. Hopefully it will show up on Youtube. But the really important thing I learned from Colbert tonight was the story of St. Corbinian. He and I are not making this up. 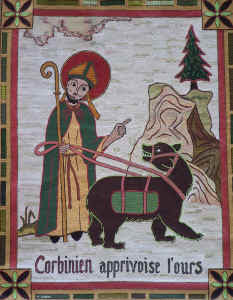 SAINT Corbinian was known for taming a bear. This is even better: "He lived in Châtres on the road to Orléans . . ."
His symbol is a saddled bear. Please note that the crest of the current pope, Benedict XVI, includes "Corbinian's Bear." Coming tomorrow: Part II of "I'm not making this up." It's even better. UPDATE: The Librarian has found the Colbert link. A lonely post on the op ed pages of the Hartford Courant is worth a read... take a look. My good friend BB, a guy from Cajun land who eats squirrels, rabbits, and such, has a new blog-- NO Pickles. Worth a read. By the way, if you ever take Mr. No Pickles to a Saints game, make sure the guy he's sitting next to is intelligent and has nice teeth. Things could get ugly otherwise. from the outlandish feast of love and positivity associated with the game last night. The first one here is quality work from Humid Haney and comrades. The Times-Picayune does a great job today by remembering the last time the Saints played the Eagles in the playoffs. The article focuses on Bobby Hebert, but also mentioned are Rickey Jackson and the dominating Saints defense of that time. At the game today, I'll be thinking about Rickey Jackson, Vaughn Johnson, Sam Mills, and Pat Swilling, one of the greatest linebacking corps in the history of the NFL. Those gentlemen were the starting Pro Bowl linebackers one year--four golden helmets stretched in a line across the field in Hawaii. Their excellence still permeates the Superdome. If Fujita and friends can play in that honorable tradition today, the Saints will win. I expect good things. UPDATE: Four and one half hours till kickoff. I was just in Whole Food on Magazine, picking up a few things to tide over Dr. Mrs. Clio and the Clio kids during the game. (Clio III is coming with me to the Game.) Joe Krown was playing piano live with his group, and John Goodman was casually shopping (with no one bothering him, because we don't do that here). This is the way we live. People who don't care and who don't know what they're doing hire consultants. I know from first-hand professional experience. Incompetent, uncaring eople who hire consultants are always talking about moving forward. I have a crazy idea: instead of voting for Mayor Curly and then have him hire consultants, why don't we eliminate the middle man? Let's vote directly for the consultants. I've held my tongue for the most part about what's gone on the past week with murders and the pathetic leadership we have. I can't even bring myself to get it all down in words. EDIT: I changed one of the paragraphs to better state my position. Let me be clear: hiring a consultant is not a surefire way to label oneself a loser. There are many competent people, companies, and governments that hire consultants for good reasons. It's just that all losers in positions of authority eventually turn to consultants, when they (the "leaders") realize they're in over their heads. My point is that intelligent people should recognize and make noise when they see desperately incompetent people wasting everybody's time and money on consultants. I'd better stop typing, because I'm typing myself out of a job. Thanks to Mr. Mel for showing me my imprecise way with words. Rants are good, but there's a limit. Rumor has it that Dr. Morris is buying eyeblack this evening. No word on Lee de Fleur's whereabouts. P. S. I want to see Coach Payton do this karate chop dance move thingy again on Saturday night. Go HERE, and do the obvious: vote for Drew Brees as NFL quarterback of the year. Children's Hospital gets a lot of money if he wins. If you're going to sell guns from your store, you must make it an impossibility that they will be stolen. An impossibility. Can't happen. Ever. All gun stores should be firearms Ft. Knoxes. B. the time mandated by law for any crimes committed by those using guns stolen from your store. Thus, if three murders are committed with guns stolen from your store, you're going away for a long time, bra. 1. Everyone who cares about Houston or New Orleans needs to read da po' blog's truly outstanding post on the murder and crime rate in Houston. The murder rate is up slightly, other crime is down, but hysteria is way, way up. Anti-New Orleans sentiment there is off the charts. I'm not making that up. That assessment comes from market research done by one of New Orleans's leading tourism-related agencies. 2. For the first time since Katrina and the levee failures and the governmental failures, the words "We're outta here" fell from the lips of both Dr. Mrs. Clio and me yesterday. We're not making any radical moves or anything, but it's just dark. Helen Hill was murdered in her house in the early morning this week while her husband, Dr. Paul Gailiunas, and toddler daughter huddled nearby. The man is a family physician colleague of Dr. Mrs. Clio. I met him once, and that meeting indicated to me what everybody is saying (b.rox among those saying it best): these are simply extraordinary people, trying to do good and make beauty in a place where it's not always easy to do either. If they can't make it here--and they didn't, since Ms. Hill is now dead and Dr. Gailiunas is understandably moving back to a safe haven--then I have doubts about trying to make it. Or it makes me want to fight more. I don't know. This is getting a lot of attention because a creative professional couple got hit horribly by violence. I know there must be even more horrible stories that do not get heard because the families hit were not as visible. But based on his track record, Dr. Gailiunas would be the first person to tell those families' stories. I just wanna go shake somebody. I don't know what to do. Blatant whining below from a guy (me) whose house had only roof damage from the storm and levee failure. If you don't want to read whining, move on to one of the reputable blogs to the right. On 12/23, we had a Christmas party at my house for a group of my friends from high school. There were about 35 people here. That generated a good bit of trash. Then Christmas Day came. We have four kids (Clio II, Clio III, Cliette, and Clio IV). The Christmas morning frenzy always creates a good bit of trash at our house. Then we had the extended Clio families over for the traditional Hooville Christmas Feast that day. That generated a lot of trash (food- and present-related). 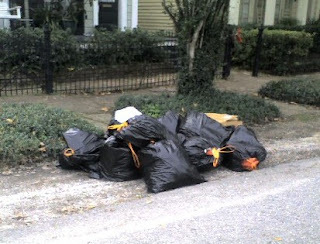 So by 12/26, there were probably 15 black bags of trash, plus a few boxes, on the side of my house. On 12/26, the T-P and WDSU both reported that trash pickup would be a day late during the week after Christmas, owing to the Christmas break. No problem, I thought. I'll put my trash out Wednesday night (my regular day is Wednesday). Boy was I surprised when the trash guys came by on Wednesday morning. Well, I was disappointed, but I've missed trash before, so I was basically okay. I'll put it out next Wednesday, right? 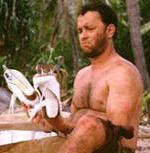 Then, yesterday, I read in the paper that twice-a-day trash pickup has resumed, and my pickup day is TODAY (Tuesday). OH NO! Sure enough, the guys had already passed, despite the fact that almost nobody on my block (including me, with my stinking pile in the alley next to my house) had put out their trash. Did I miss something? I didn't get any mail or email announcing that trash pickup would start Tuesday--until Tuesday, that is, when I read it in da paper. So Berto and I took about a third of the stuff out late last night and disposed of it. I'm sure my neighbors love me right now. NOLA--sometimes even when we get it right (resumption of trash pickup), we get it wrong. Bureaucracy is not self evaluative, it kills. Must read article.